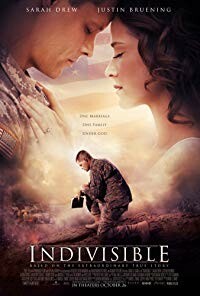 Plot: Upon returning from serving in the U.S. Army, Chaplain Darren Turner faces a crisis that shatters his family and faith in God but through the help of his fellow soldiers, he returns to his faith and family. Starring: Justin Bruening, Sarah Drew, Jason George, Tia Mowry-Hardrict. distributed by Pure Flix «Indivisible» in the US movie theaters released on October 26, 2018 and has grossed over $3 million worldwide; dvd and blu-ray release date was set for January 29, 2019. Rent from Netflix and Redbox from January 29, 2019. «Indivisible» in the UK has no theatrical release date. DVD and blu-ray release date is not available at this time.